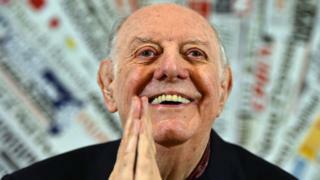 Dario Fo, the Italian playwright and actor famous for his cutting political satires, has died in Milan at the age of 90. Fo, whose plays include Accidental Death of an Anarchist and Can't Pay? Won't Pay!, won the Nobel Prize for Literature in 1997. He was also known for Mistero Buffo, a one-man play he travelled the world with for 30 years. His plays often starred his actress wife Franca Rame. Italian Prime Minister Matteo Renzi, a target himself of Fo's sharp wit, remembered him on Thursday as "one of the great protagonists of theatre, culture and the civic life of our country". He said: "His satire, his research, his work on set design, his multi-faceted artistic activity remain the legacy of a great Italian in the world." Born in March 1926 in Sangiano, a small town on Lake Maggiore, Fo learned the art of storytelling from his grandfather, a travelling salesman with a gift for spinning yarns. He was conscripted towards the end of World War II but managed to escape, spending the last months of the war hidden in an attic. Moving to Milan, Fo studied architecture before turning to writing and performing. After meeting Rame in the early 1950s, he achieved success with a series of monologues that led to his own show on Italian national radio. After establishing the Fo-Rame theatre company in 1957, Fo and his wife earned national recognition with a series of hit stage farces. But their work, often critical of the political establishment, led to battles with the censors and attempts at suppression. Dario Fo thought the long Italian tradition of commedia dell'arte - broad, even slapstick humour - could be used to comment on modern society. His work was filled with energy and political protest. He drew on the history of Italian theatre but became one of the most performed modern playwrights anywhere. His early material was gentle enough, but Fo later became a sharp-eyed satirist of the Italian state and corruption. For years he was banned from Italian TV for his irreverence. His radical politics meant he was twice prevented from entering the USA. Writers, among them Arthur Miller, protested at his exclusion. When Fo was awarded the Nobel Prize for Literature in 1997, the citation said he "emulated the jesters of the Middle Ages in scourging authority and upholding the dignity of the downtrodden". On stage, Dario Fo made serious political points by being comic. Accidental Death of an Anarchist, Fo's best-known play, was written in response to the real-life death of a political anarchist while in police custody. First performed in 1970, it went on to be staged in more than 40 countries. Fo, who was admitted to hospital earlier this month, had been due to give a talk in Edinburgh last weekend. Playwright David Greig paid tribute, saying Scottish theatre "owed a tremendous debt" to "an extraordinary theatre maker".